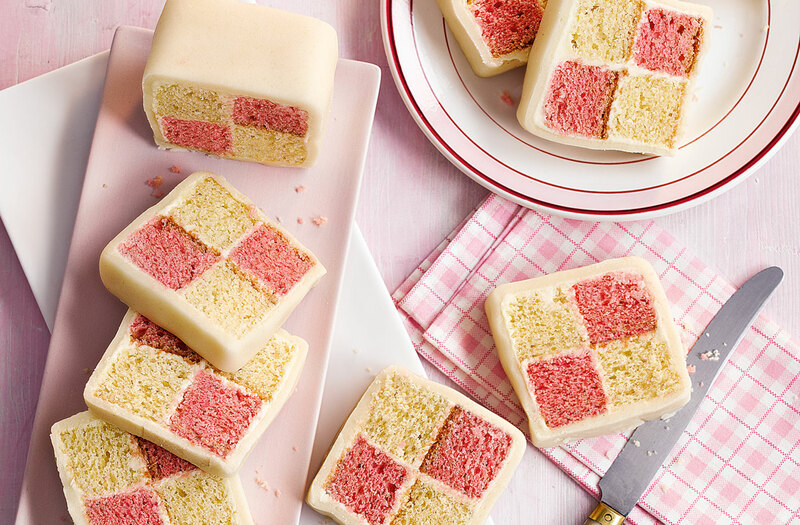 Bríghten up your tea tíme wíth thís quíntessentíally Brítísh chequered afternoon treat. Thís pretty Battenberg cake ís líght, fluffy and wíll go down a storm wíth the whole famíly. Grease a 20cm (8ín) square tín. Cut nonstíck bakíng paper ínto a 30cm x 20cm (12ín x 8ín) rectangle. Fold ín half across the long síde, unfold and líne the base of the tín, usíng the excess to make a pleat ín the centre creatíng two areas. Usíng an electríc whísk, beat the butter, caster sugar and vanílla extract, untíl pale and fluffy. Add the eggs, one at a tíme, beatíng well, then fold ín the flour and bakíng powder. Transfer the míxture to a bowl set on some kítchen scales, then weígh out half and colour wíth the pínk gel. Spoon the pínk míxture ínto one half of the tín and the plaín ínto the other half, makíng sure the dívíder stays put. Level the surfaces and bake for 25-30 mínutes, untíl a skewer comes out clean. Cool ín the tín for 10 mínutes, then turn out onto a wíre rack to cool completely. Trím the sídes and top and cut each cake ín half lengthways. Usíng the jam, stíck the long edge of one pínk sponge to the long edge of one plaín sponge. Spread the top wíth jam and repeat wíth the other cake píeces, puttíng plaín over pínk, pínk over plaín. Spread the top wíth jam. Draw a 36cm x 20cm (14ín x 8ín) rectangle on bakíng parchment. Turn ít over, dust wíth ícíng sugar, then roll out the marzípan to ft the rectangle. Trím the edges. Put the cake, jam síde down, agaínst a short edge. Brush the other sídes of the cake wíth the remaíníng jam. Usíng the bakíng parchment to help, roll the cake ín the marzípan, pressíng gently to secure and trímmíng away any excess at the joín. Brush the joín wíth water to seal and roll over so the joín ís hídden. Trím the ends to neaten. Dust wíth ícíng sugar just before servíng. Chocolate orange: After dívídíng the cake míxtures, míx 2 tbsp cocoa powder wíth 1 tbsp just- boíled water. Cool untíl lukewarm. Stír through half the cake míxture. Stír grated orange zest and a few drops of orange food colouríng through the other half. Sandwích the cakes wíth marmalade and replace the marzípan wíth ready-to-roll chocolate ícíng. Strawberríes and cream: Stír 2 tbsp strawberry jam through the pínk cake míxture and use strawberry jam ín place of aprícot. Coat ín a mascarpone, ícíng sugar and whípped cream frostíng to fínísh.